This week your Outside the Box is from my friend Ben Hunt, who writes his letter under the title Epsilon Theory. This edition is a little darker than usual, and certainly more of a think piece. A central argument that Ben makes in Epsilon Theory is that it is Narrative that is the driver of politics, economics, and social interaction generally. The Narrative is what we all (mostly) believe and act upon. Investors generally believe that quantitative easing is going to result in a rising stock market, so they act as if another round of QE and continued low or negative rates are good for the equity markets; and thus the game goes on. Ben wraps his discussion of narrative in game theory, at which he is something of an academic expert. And this week he talks about “crisis actors,” those people who use Narrative to suggest to the masses (that would be us) outcomes they think are positive. But of course, the crisis actors have both good intentions and bad ones. And ultimately their intentions don’t matter so much as the creation and maintenance of the Narrative to which we all adapt and continue to support … until that Narrative breaks, sometimes very profoundly and abruptly. Or at other times a Narrative might just fade away with the shifting social seasons. A key point Ben makes is that to fight the Narrative can be self-destructive. Fighting the Fed just because you think what it is doing is wrong doesn’t make any sense from a personal game theory perspective: the purpose of playing the game is to make sure that you get the most possible benefit. But at the same time, we must try to understand the power of the Narrative and how it works and to have some discernment as to when the Narrative might no longer work, and move to the sidelines. Or possibly even figure out how to make the Sturm und Drang of the Narrative actually work in our favor. Ben likes to start his letters off with a bunch of obscure quotes. (I often do as well, but he uses far more quotes and interesting ones, too – I have no idea where he comes up with some of this stuff, but it’s a fun few pages). The real work starts on about the fourth page of this essay. I think you’ll find Ben’s letter to be very interesting. Rather than add any personal comments, I think I’ll go ahead and hit the send button and let you go straight to Ben’s essay. Have a great week. Man in Bar: Tomorrow, I’m gonna be a hero. Man in Bar: You may just be a patsy, but you’re an important one. In fact, I don’t think I’ve ever met a bigger crisis actor than you before. ... This is for our country! Göring: Why would some poor slob on a farm want to risk his life in a war when the best that he can get out of it is to come back to his farm in one piece? ... It is always a simple matter to drag the people along, whether it is a democracy or a fascist dictatorship or a Parliament or a Communist dictatorship. The people can always be brought to the bidding of the leaders. That is easy. All you have to do is tell them they are being attacked and denounce the pacifists for lack of patriotism and exposing the country to danger. It works the same way in any country. Hermann Göring and the Nazis didn’t burn the Reichstag down in 1933. They left that to a simpleton Communist patsy (that’s him in the photo; quite the ur-terrorist, no?). But Göring and the Nazis used the Reichstag fire as their excuse to arrest thousands, establish Hitler as the Führer, and unleash a decade-plus of fascist horror on Germany and the world. History is rhyming today, as it always does. Hynkel, the dictator, ruled the nation with an iron fist. Under the new emblem of the double cross, liberty was banished, free speech was suppressed and only the voice of Hynkel was heard. 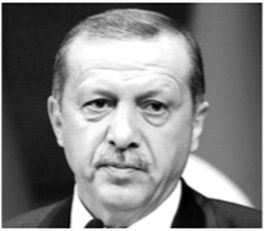 Just need a little hair dye on that Erdogan moustache, and I think we’re good to go. Harry Angel: You're crazy. I know who I am. You're trying to frame me. You're trying to frame me. Cyphre, I know who I am. You murdered them people. I never killed nobody. I didn't kill Fowler, and ... and I didn't kill Toots, and I didn't kill Margaret, and I didn't kill Krusemark, I didn't kill no one! Louis Cyphre: I'm afraid you did, Johnny. Harry Angel: My name's not Johnny! Louis Cyphre: All killed by your own hand. Guided by me, naturally. Frankly, you were doomed from the moment you slit that young boy in half, Johnny ... for twelve years you've been living on borrowed time and another man's memories. 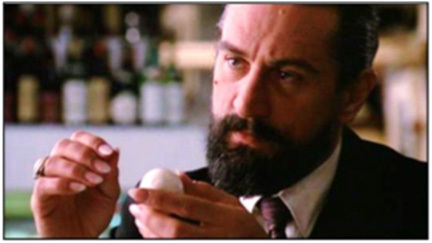 Alan Parker, "Angel Heart" (1987).My favorite De Niro role, worth watching just for the fingernails and the way the man eats an egg. 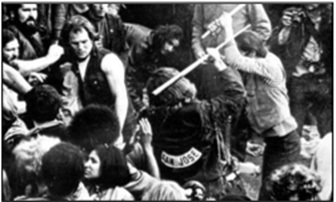 Four people died at the 1969 Altamont concert, including a front row murder during the Stones set. It’s fun to strut on stage and sing about this stuff, until the Hells Angels show you what you’re singing about. 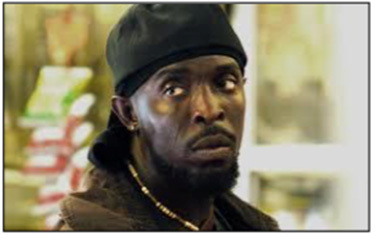 Everything I know about politics, I learned from “The Wire”. That and a Ph.D. in Government from Harvard. But mostly “The Wire”. 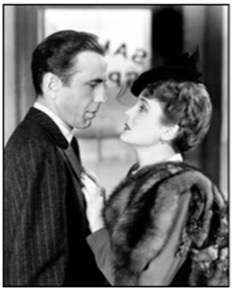 Sam Spade: I hope they don’t hang you, precious, by that sweet neck. Yes, angel, I’m gonna send you over. The chances are you’ll get off with life. That means if you’re a good girl, you’ll be out in 20 years. I’ll be waiting for you. If they hang you, I’ll always remember you. I think it’s a guy thing, this willingness to be a patsy for a cause, be it love, or lust, or greed, or religion ... or a political party. Don’t be a patsy. Be a Sam Spade. Be an Omar. A “crisis actor” is a familiar theme in all sorts of conspiracy theories. Basically, the idea is that terrorist attacks and the like are false-flag operations, where nefarious government agencies kill their own citizens, directly or indirectly, in order to instill fear and maintain popular support for the smiley-face authoritarianism of the modern State. Crisis actors are the patsies hired by the agencies to weep and wail for the cameras, creating the initial Narrative of terror and supporting the follow-on Narrative of steely government resolve to track down the supposed bad guys. As per usual with conspiracy theories, the specifics of their claims about crisis actors are nonsense. It’s not “the same girl” crying at Newtown and Orlando and Nice, as the photos on conspiracy websites claim. CNN isn’t a secret division of the CIA. Neil Armstrong really did walk on the moon. But as also per usual with conspiracy theories, they’re not thinking big enough. Crisis acting isn’t found in the secret construction of a crime scene. It’s found in the public construction of a social Narrative. It’s found in the public statements of the Missionaries (to use the game theory term) who create Common Knowledge — what everyone knows that everyone knows. Hermann Göring and Erdogan are crisis actors, pretending that the Nazis or the Islamists are the only force standing between the Motherland and political traitors within and abroad, pretending that their “emergency policies” are anything less than a permanent seizure of political control. It’s oh so easy to look at what’s going on in Turkey and shake our heads and tsk-tsk that awful Erdogan and the awful anti-democratic things he’s doing over there. Because it IS awful. What’s happening today in Turkey is absolutely a carbon copy of what happened in Germany in 1933 with the Reichstag Fire, and every Western president and prime minister and chancellor and secretary of state and foreign minister — all of whom are mouthing the same diplo-speak pablum about the Islamist fascists of 2016 that their counterparts mouthed about the Nazi fascists of 1933 — will have the same stain on their souls. Not that I’m sure many of this 2016 crowd have a soul left to stain. As Gertrude Stein famously said about Oakland, and I’m saying about these crisis actors, there’s no there there. Whatever human beings they used to be, it seems they’ve been absorbed by their public cartoons, which is really just ... sad. But look homeward, angel. Look homeward, too. 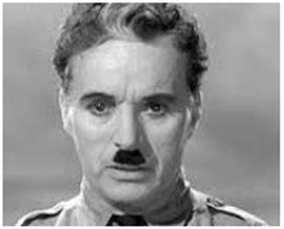 Paul Krugman and Tom Friedman and Jim Cramer and their media Missionary kin are also crisis actors, pretending that the Brexit vote was a deluded, colossal mistake perpetrated on innocent UK voters by economic traitors within and abroad. Janet Yellen and Mario Draghi and their central bank Missionary kin are also crisis actors, pretending that their “emergency policies”, now more than seven years old, are anything less than a permanent political shift in the global allocation of money and credit. I mean, can’t we just stop these charades surrounding “the Horror of Brexit” and “data dependence”? Can’t we just admit that it’s all an exercise in — to use the Fed’s terminology — “communication policy”, where words are chosen for effect rather than to convey true belief or opinion ... or what we would call in normal human interaction “lying”? Of course we can’t. Whether you’re Göring or Erdogan or Yellen or Draghi, once you start weaving that tangled web of deception, you can’t un-weave it. Once you sell your soul to the Narrative Devil you can’t buy it back. Erdogan can’t walk his purge back even if he wanted to. Yellen can’t walk her dot plots and forward guidance back even if she wanted to. Draghi and Kuroda are never going to go on stage and shrug their shoulders and say “oops, sorry ‘bout that.” At least St. Louis Fed Governor Jim Bullard didn't have to flee to Greece for his "failed dot plot coup". And yeah ... I understand that I’m tarring central bankers and their fellow travelers with the fascist brush. Because the road to hell is paved with good intentions as well as bad. Because there IS a moral equivalence between the means used by Göring and Erdogan to accomplish their ends and the means used by central bankers to accomplish theirs. Do the differing ends and the better intentions matter? Of course they do. And that’s why Ben Bernanke gets $250,000 per speech and Hermann Göring got a cyanide pill in his prison cell. But the shared means of false Narrative and crisis acting matter, too, because they create a world of profound inauthenticity, where ALL public speech is deemed suspect and self-serving — because it is! — and where ANY public speech, no matter how demagogue-ish or false or borderline insane, is deemed functionally equivalent to any other speech. Because it is. It’s what I call Gresham’s Law of Narrative: inauthentic speech drives authentic speech out of circulation, just like bad money drives good money out of circulation. If the function of public speech is to persuade rather than inform — and that’s precisely the function of forward guidance and every other status quo political statement of the past seven years — then it’s just comical for those same status quo institutions to complain now that their political opponents are “lying”. No, they’re just more effective persuaders. They’re just better liars. And yeah ... I’m saying that the rise of Trump and Farage and Le Pen and their ilk is a direct consequence of the communication policy toolkit and the crisis acting employed by every Western central banker and politician over the past seven years. That’s exactly what I’m saying. As for us investors ... we’re the “poor slobs on a farm” that Hermann Göring talks about in his prison cell interviews during the Nuremberg Trials. We don’t want to go to war, whether it’s a real-life war like Erdogan is waging or an ersatz war like Yellen and Draghi are waging. As Göring said, the best outcome for us is that we get home to our farms alive. Why in the world would we sign up for that? We sign up for it because we are biologically hard-wired over millions of years and socially soft-wired over tens of thousands of years to respond to Narrative. We are social animals in the scientific, technical sense of the phrase, and we — along with our termite, ant, and bee cousins — are the four most successful multi-cellular animal species on Earth because of it. The hallmark of what biologists call a eusocial species isn’t just that it communicates. It swims in an ocean of communication. It is evolved to be immersed in constant communication. How many waking minutes of every day are you away from some sort of message from other humans? Five? Ten? For me it’s however long my morning shower takes. That’s about it. Probably about the same amount of time that an ant or a termite goes without a message from another ant or termite. That’s the human animal for you ... basically a giant termite with fire. As a eusocial species, we ca n no more ignore a message from Janet Yellen than an ant can ignore a pheromone from its queen. Not only can we not ignore it, but it WILL move us, in some small way, at least. Thankfully, though, unlike an ant we have self-awareness. Or at least the capacity for self-awareness. We can recognize that this process of Narrative influence is happening to ourselves and to others, and we can resist if we choose to. Now, we will probably go along with whatever the Narrative is suggesting we do, because that’s usually the smart play. We know that there are millions of other ants hearing the queen’s message, and we know that each of them will be moved by her message. Plus — and this is the big insight from game theory, the engine for all of these Common Knowledge behaviors — we know that all of the other ants are thinking about US in exactly the same way we are thinking about THEM. Knowing that, it is entirely rational for each of us to act AS IF the queen’s message is True with a capital T.
But acting AS IF doesn’t mean acting AS. That’s what the patsy does. The patsy is the guy who believes, deeply madly truly, that the queen’s message is True with a capital T, forever and ever, amen. The patsy is the guy without self-awareness. The patsy is the guy who doesn’t recognize that he’s being played. As the old poker saying goes, if you’ve been playing cards for half an hour and you don’t know who the sucker is ... it’s you. 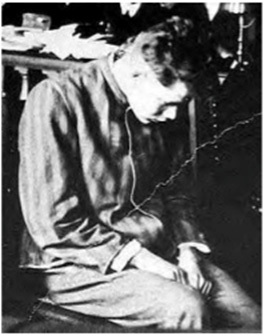 The entire reason I write Epsilon Theory is to do my small part in preventing people from becoming suckers, from accepting Missionary statements at face value, from believing in their heart of hearts that maybe 2 + 2 = 5 and that maybe the Emperor is wearing a fine suit of clothes after all. The inescapable human Truth, of course, is that we are ALL being played ALL the time. 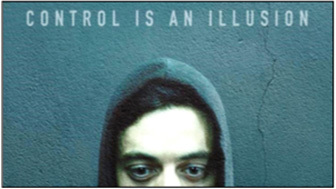 But if you’re self-aware, you can resist. You can resist in your heart even if you comply in y our behavior, and you can resist in your behavior if and when you choose. You know that you are being played, and you choose to go along with the game. For now. Okay, Ben, all very heroic and heartfelt, but what do we do? Well... here’s what we don’t do. We don’t “fight the Fed”, and we don’t stick our head in the sand and pretend that the status quo Missionaries can’t construct highly investable rallies. You know, like the rally we’re experiencing right now. But by the same token we don’t allow ourselves to become a patsy for the Fed or the ECB or the DNC or the RNC or the WSJ or the NYT or CNBC or whatever other institutional collection of initials asks you to play the fool. We should never trust the Fed or any other Missionary, because one day we’re going to need to, if not fight them, then at least take ourselves off their battlefield. I think what we need to DO is identify the potential political and economic catalysts coming down the pike and figure out which of these are potential Humpty Dumpty moments — crack-ups in the current system of global credit allocation that are too large for the central banks to piece back together again with their crisis acting and Narrative creation efforts. Then we need to track that Narrative effort so we can get the timing right on these massive catalysts. Because as any coup-launcher or Fed-fighter or volatility-embracer knows, if you’re wrong on timing ... you’re just wrong. There Is No Business Like Show Business! This is probably one of my last days in publishing Dave’s Daily. What do you mean “probably”? I may continue to blog now and again. But again, nothing is certain. What is certain: I will be dealing less with premium membership and trading activity going forward. And I’ve been this for over 40 years, sigh. Perhaps more book writing is on the agenda. For many months, nay years, the ongoing “bad news is good” theme has been with us. It’s getting tiresome. So it is for me. Friday was an end of month classic. The GDP Report was released and was surprisingly weak at only 1.2% vs 2.5% expected. Who or which sector to blame this time? Pick one. Business Investment fell 2.2%, it’s 3 quarterly decline Gross Private Domestic Investment lost 9.7% and Residential Investment fell 6.1%. It’s not a pretty picture. As early trading saw stocks decline sharply they suddenly reversed. This was caused as traders thought bad economic data meant a weak dollar causing a reversal in commodities. This as early news featured a large build in Saudi oil production. The bottom line, bond prices rose causing many to think the Fed couldn’t raise interest rates given economic weakness meaning bulls were given a greenlight to go for it. Most of the action Friday that was positive was in emerging markets, Europe and commodities. Beyond that, the usual suspects delivered except for Financials where results disappointed. Volume was anemic and breadth per the WSJ was positive. Well, it’s been a lots of fun and we’ll see you when we do. 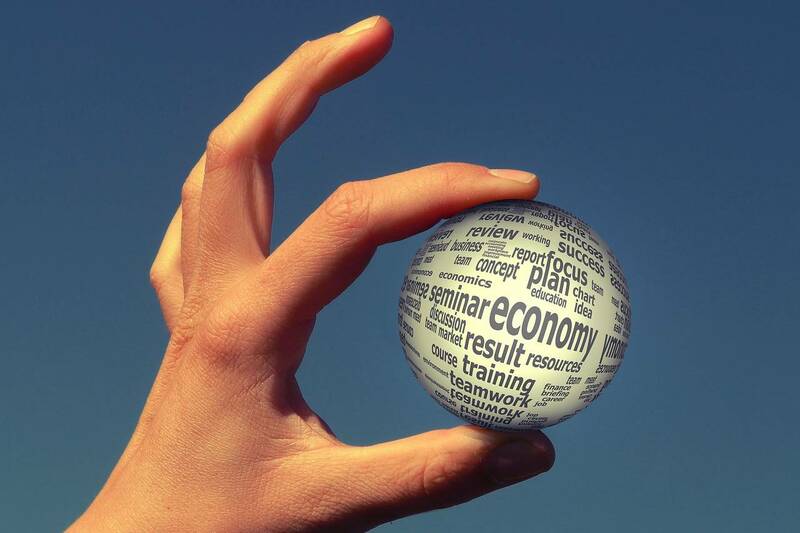 The economy is not crashing, despite the Federal Reserve unconventional stimulus. In fact, a number of metrics suggests 2016 may be better than 2015. Is the U.S. economy headed for another recession? Of course it is. As soon as one recession ends, the economy is always headed for another. Especially in this cycle, the ultralow interest rates maintained by the Federal Reserve have virtually ensured the buildup of financial excesses that, once corrected, will likely cause a contraction in overall output. Those were my introductory remarks (repeating my lead in a May 28 Barron’s cover story about the inevitability of market crashes), as part of a panel on the economic outlook at a conference held each July in Las Vegas called “Freedom Fest.” While there is always plenty to be festive about at this four-day event, prognostication sessions are often punctuated with talk of “economic Armageddon”—the very words of one my colleagues on the panel. Free-market economists who are sensitive to the heavy hand of government tend to err on the side of pessimism. So I began by speaking of the inevitability of recession in order to establish my bona fides in this company. I share the view that the government does far more to destabilize the economy than to stabilize it. With all that said, however, I outlined my reasons for believing that Armageddon is not about to happen. In fact, economic growth in 2016 could even show a pickup from 2015’s dismal rate. IRONICALLY, IT MAY BE that the very sluggishness of this expansion—the slowest on record—has been a key reason why excesses have not yet become apparent. In the housing market, for example, it was reported last week that the slow and steady rise in the purchase of existing homes continues, at an annualized rate in June of 5.6 million units—a nine-year high, although way down from the 7.1 million average of 2005, or the 6.5 million average of 2006. And back then, there were fewer households headed by someone 25 and older that might be in the market for a home. Back then, however, there was also a housing bubble that was about to burst. But while the median price of an existing home rose to $247,700 in June, it was still lower, in today’s dollars, than the July 2006 peak of $275,000. Speaking of interest rates, one fairly reliable indicator of imminent recession is a flat or inverted yield curve. Normally, long-term rates are higher than short-term rates. But when the yield curve goes flat or inverts, short-term rates are equal to or greater than long-term, and a recession generally results. Right now, the difference between the 10-year Treasury note and the three-month Treasury bill is 125 basis points, or 1.25 percentage points, indicating a relatively normal yield curve. Finally, there is the remarkable performance of new unemployment insurance claims (see chart). 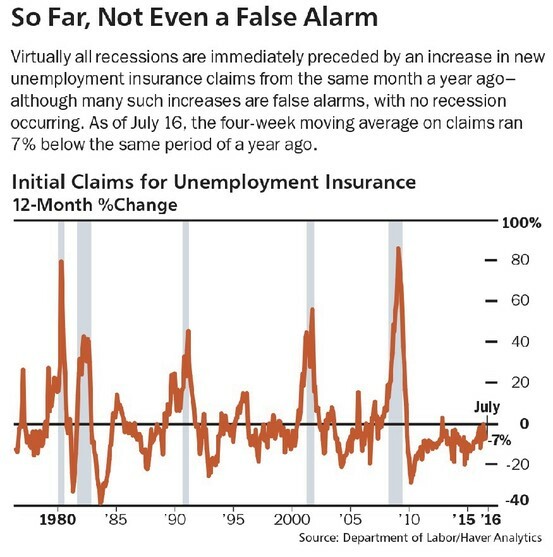 Virtually every recession is preceded by an increase in claims from the same month a year earlier. But not only have claims been running at historic lows, they keep falling to ever-lower lows, most recently at 7% below that of the same month a year ago. On Friday, the Bureau of Economic Analysis will report the first estimate for gross-domestic-product growth in the second quarter. Look for growth at an annualized rate of 3% or greater. Gold Shows Resilience Despite A Hawkish Fed - Is It Time To Abandon Our Sub-$1300 Gold Call? 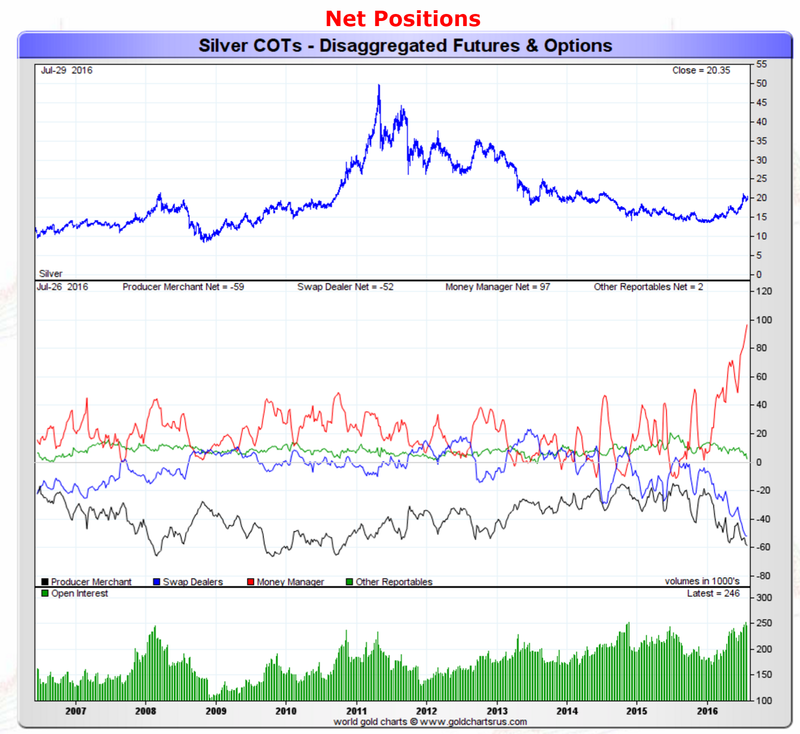 - The latest COT data shows gold speculators pulling back modestly while silver speculators increased their bullish positions. - None of the COT data includes the precious metals rise at the end of the week as the report is based on Tuesday's gold market close. - Some of the reason for gold's resilience is due to paper traders questioning if the Fed has any ability to raise rates. 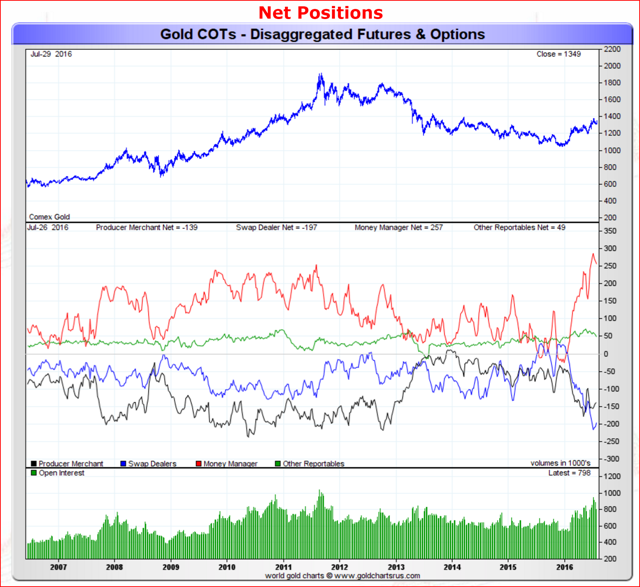 The latest COT report was a bit dated as it contained positions as of Tuesday afternoon, so it doesn't include any of the Federal Reserve boost that gold experienced on Wednesday or Friday's poor GDP gold price increase. Having said that, it still gives us a good feel of the trends of what speculators are doing. This week's report showed speculative gold longs decreased their positions for the third week in a row, while shorts decreased their own positions for the second week in a row. It looks like a bit of the speculative froth is being taken out from the long side of things, but we do note that despite the consecutive weekly declines of around 10,000 long contracts, gold has only dropped by minute price terms when looking at it on a percentage basis - each weekly drop was less than one percent. 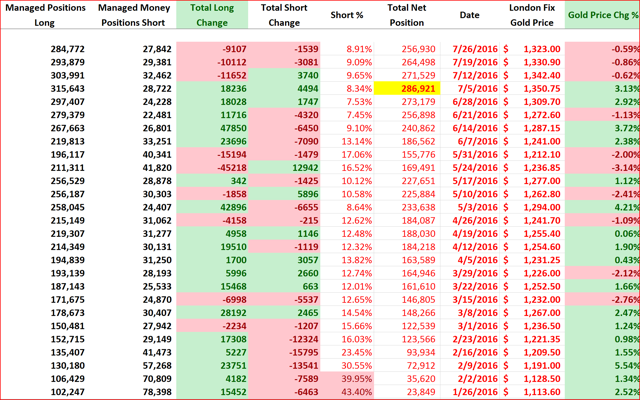 At this point it doesn't seem that shorts are interested in going short gold as despite the drop in longs we are not seeing shorts increase their own positions. Additionally, since none of this includes the price jumps in gold later on in the week, we probably have higher long and lower short positions as of Friday's close. The red-line represents the net speculative gold positions of money managers (the biggest category of speculative trader), and as investors can see, speculative traders have taken a break from their parabolic rise and sit at a net long position of 257,000 contracts. The red line which represents the net speculative positions of money managers, increased by a little more than 5,000 contracts while shorts increased by a mere 470 contracts. Another week and another increase in the net speculative silver long positions. What is interesting though is that we didn't see commercials short this week's increase in speculative longs. What is interesting about this is that usually we see Producer/Commercial short positions increase into speculative rallies - this week we didn't see that. It may be nothing or it may show that producers are reluctant to sell forward at these prices and are expecting a higher silver price, which of course would be very bullish. Both gold and silver seem to show extraordinary resilience despite the extremely high speculative positions. As we mentioned last week, we are looking for a sizable pullback in gold as everyone seems to be on one side of the trade here. But after the Fed meeting, which was arguably a slight bit hawkish, it looks like gold is rising to a different tune and doesn't seem to want to pull-back. We think what's going on here is that gold is calling the Fed's bluff and is now reacting to a Fed that it doesn't think is able to raise rates. That may explain the divergence between the physical and paper markets as paper market traders are well informed with the Fed and track it religiously (and trade accordingly), while physical buyers don't buy gold on a .25% rise or fall in interest rates. They buy because it's a secure way to store wealth and insurance for financial calamities. Since it's obviously paper traders that are currently driving the gold price higher (evidenced by the massive net long position in the COT report), they have essentially turned gold into a proxy for the Fed's ineptitude. The Fed's weak position is driving gold higher and higher as the market no longer believe the Fed has the wherewithal or courage to raise interest rates - or at least that's what paper gold traders currently believe. So is it time to abandon our wait for a gold pullback? That's the important question because we are long-term gold bulls and we believe in a much higher gold price for the future. Every day is one day closer to that reality for us - and more money we leave off the table by not being fully allocated to gold and gold miners. Currently the answer is "no" we are not ready to abandon our call for a pullback in gold that would take it below the psychological $1300 level. We are not convinced yet that the paper markets can drive gold higher without the physical markets participating, and the reported $100 gold discounts in India are not reassuring us that physical markets are hungry for gold. We aren't stubborn though, and if we see gold continue to rise while physical demand in India and China pickup then we'll be much more open to abandoning this call. But at this point buying some of our gold-bullish trading positions with such a large amount of bulls in the trade seems very reckless and we simply don't think it would be disciplined investing. Thus while we can't ignore gold's strength, we still do not yet think it's the time to re-initiate some of the gold positions we have sold. 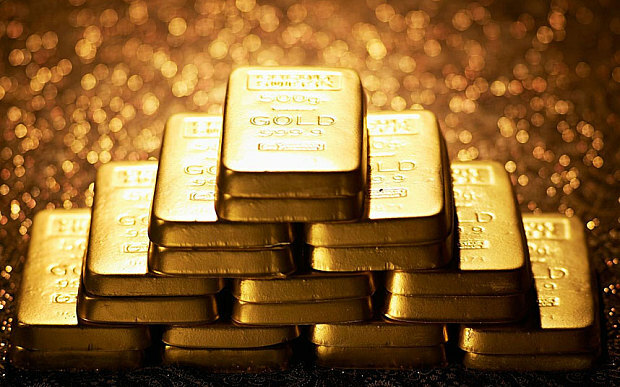 Thus we think investors should hold off or lighten up on gold positions in the ETFs and miners such as the SPDR Gold Trust ETF (NYSEARCA:GLD), ETFS Pxxhysical Swiss Gold Trust ETF (NYSEARCA:SGOL), and miners such as Randgold (GOLD) and Barrick Gold (NYSE:ABX).